Bathroom Solutions Blackpool and Fylde Sunday Football Alliance leaders Blackhurst Budd moved closer to another premier division title with a 3-0 win over second-placed AFC Additions. Josh Miller led the way with a brace and Danny Morris was also on target as Budd went 10 points clear at the summit with their 15th straight win. They still have five games to play and could clinch the title this weekend. A and P Autos kept alive their hopes of second place with a hard-fought 2-1 win against Eurotech courtesy of a Dax Hoogerwerf goal and a stunning Lee Barker free kick. Kyle Magee replied. 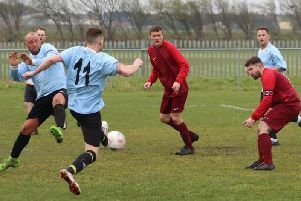 Second-placed Anchorsholme’s hopes of climbing any higher in division one ended when they were beaten 3-0 by Belle Vue thanks to goals from Andrew Duckworth, Joe Caton and Ahern Playforth. Third-placed Bloomfield Brewhouse clung to their slim chance of catching Shovels as they beat AFC Jewsons Backpool 6-2 courtesy of goals from Antony Buxton, Matty Hole, Ross Swift, Ben Perry-Acton, Antony Buxton and Aaron McGary. Tim Dixon and James Schofield replied. Tom Ashworth and Sean Roberts scored as Chris Allen Garages beat AFC Lane Ends Blackpool 2-0. BES Utilities stayed on target for the division two title with a hard-fought 6-4 win in their penultimate match at King Edward, where Lee Grundy scored a hat-trick. Jack Porter, Chris Evans and Dom Ritchie also scored, while King Edward’s goals came from Rob Heritage (2), Stephen Peters and Callum Hitchon. A Simon Annetts brace and a further strike from Kyle Nixon kept second- placed The Bridge in the title race with a 3-0 win at Metrostars, though it is out of their hands. Still definitely in charge of their own destiny are third-placed Broomheads Estate Agency, who beat Marshall Court 7-2 and have eight games in hand on the leaders. Jack Gaffikin scored a hat-trick and Kenny Cram a brace, while Jordan Casey and Danny Green also scored and Josh Wileman and Stuart Hammond replied. Alex Prejmereaunu also scored a hat-trick to help Up-Rite Scaffolding beat Lane Ends 5-2. Otis Chambers and Adam Fishwick also scored, with Steven Turner and Andrew Kozlowski replying. In the quarter-finals of the Berrys Beds Division Two Cup, Nitisat Sirisom scored a hat-trick and Stephen Caldwell a brace as FC Albion beat the league’s bottom club The George 5-1. Ben Johnson replied. Blackpool Wren Rovers lost further ground in the West Lancashire League title race but do have a Richardson Cup final to look forward to. Wrens hammered Fulwood Amateurs 6-1 in Wednesday night’s semi-final at Garstang. The tie was poised at 1-0 until two minutes before half-time, when Nick Greenall doubled the lead given to Blackpool by Joe Booth. Danny Morris and Carl Eastwood both scored twice in the second half to secure Wrens’ date with Tempest or Garstang in the final. On Saturday, Rovers looked to be heading for a disappointing premier division defeat after hosts Euxton converted a 90th-minute penalty through Michael Galliers but there was even later drama as Greenall equalised in the eighth minute of stoppage time. The draw left Wrens three points behind Longridge Town, who were comprehensive 8-2 home winners over Coppull United. There was more late drama as Garstang’s last-minute equaliser to draw 3-3 at Southport Hesketh. The hosts went 2-0 ahead but were pegged back on the hour by Aaron Hislop. Southport regained their two-goal lead cushion but Garstang scored twice in two minutes to earn a draw, Jonny Hothershall reducing the arrears in the 89th mintue before Rick Coat equalised. Garstang missed out on a place in the Lancashire Amateur Shield final, losing their semi against Burscough Richmond 4-3 on penalties after Tuesday’s 1-1 draw. Garstang remain fifth in the league, three positions above Thornton Cleveleys, who went down 2-1 at home to Turton. Matt Wood equalised for Thornton just after the half-hour but Ally Dickson’s second goal sealed the points. Wyre Villa found themselves on the wrong end of a seven-goal thriller at GSK Ulverston Rangers in division one. Dale Patten, Phil Smythe and Dan Hudson netted in vain for Villa. Lytham Town went down 1-0 at Burscough Richmond and remain 10th. League leaders Poulton weren’t in action and title rivals Haslingden St Mary’s reduced the gap at the top to a single point with a 1-0 win over Hurst Green and they still have five games in hand. FC Rangers Under-21s’ outstanding run to the first-ever Lancashire FA Under-21 Cup didn’t have a happy ending as they were beaten 6-0 by Lancaster City in the decider the County Ground in Leyland. Will Fraser-Gray and Joe Wearing both scored twice, with Rob Walker and Tom Knight also on target as the Dolly Blues netted three in each half. The Giant Axe team are going for the double as they battle Lytham Town for the league title. These two clubs have pulled clear in the competition’s inaugural season.